He decides to answer the ad and, thus, submits himself to a number of tricky tests. Some of the tests are traditional pen-and-paper tests, others are very nonconventional (Reynie doesn’t know that some of the challenges he overcomes are actually character assessments). It’s survival of the fittest, and, after each test, nearly all of the children are sent home for failing to pass. But, at the end of the test day, Reynie and a few other children are left standing. Constance Contraire, a teeny-tiny, ornery girl, who is extremely stubborn and not very nice. They gather at the hideout of Mr. Benedict, a super smart, very kind narcoleptic. Mr. Benedict describes a secret, dangerous mission that he believes only Reynie, Sticky, Kate, and Constance (working as a team, of course) are equipped to handle. After mulling it over, the kids accept Mr. Benedict’s challenge. As they begin their mission, they decide they need a group name. And, thus, they dub themselves The Mysterious Benedict Society. 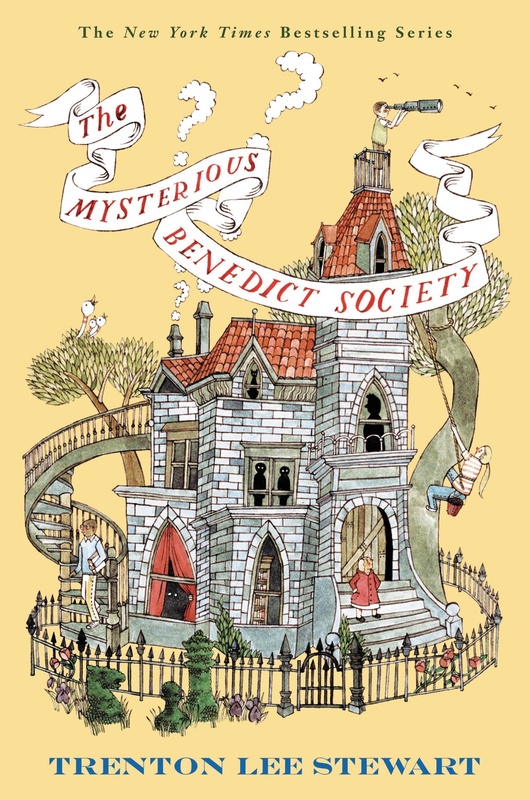 The Mysterious Benedict Society is the first in the series (currently, three books about the kids, one book about Mr. Benedict’s background, and one book of puzzles and brain teasers). Each chapter begins with a fun illustration by Carson Ellis (you might recognize her work from The Decemberists’ albums—like this one). For teachers’ reference, the book’s AR (accelerated reading) level is 5.6 (to give some perspective to those non-teachers out there, Harry Potter and the Sorcerer’s Stone is AR 5.5). The book may be a kid’s book, but, like the Harry Potter series or A Series of Unfortunate Events, The Mysterious Benedict Society is enjoyable for adults, too. It’s a fun story, the characters are unique and quirky, and there’s a lot of (often farcical) action. And, as expected, there’s a good underlying message. So, why the low rating? This book suffers from a highly contagious children’s-book symptom spurred by the Harry Potter series: it’s way, way too long. At just over 500 pages, it would have benefited greatly from a significant edit. Who should read it: Danielle and Toya (i.e., people who have super smart and adventuresome little ones to whom or with whom they can read this book); Dawn (i.e., teachers who read aloud to their kids or are looking for books to recommend to kids for SSR—it would be a good one to read aloud to second, third, fourth, or fifth graders). Bonus! The series has a great website that kids would love. It has info on all the books and characters, as well as online games and puzzles. If you’re looking for something similar but a little edgier, try: A Series of Unfortunate Events by Lemony Snickett (the first few books in the series are delightfully dark, creative, and funny). This entry was posted in Rating: 2.5/5 and tagged Book review, Books, Carson Ellis, Children's Book, The Mysterious Benedict Society, Trenton Lee Stewart. Bookmark the permalink.